Two exhibitions and two cities to celebrate the greatest Italian sculptor of the first half of 20th century, Arturo Martini (Treviso 1889 – Milan 1947). In Bologna at Palazzo Fava, the exhibition Creatures. The dream of the earthenware, will be curated by Nico Stringa. Creatures is Massimo Bontempelli’s definition of the dreaming figures created by Martini in the central period of his activity which determined a decisive change in the monolithic realm of Italian sculpture. For the first time, Arturo Martini’s great earthenware works dating from the period 1928-1932 shall be exhibited together. Arturo Martini’s creative process was notoriously concentrated into a short period of feverish activity, sometimes lasting only a few weeks, which he himself called the time of song. These phases gave rise to his most elevated poetic. Thanks to his great earthenware sculptures, the artist first became established during the I Quadrennial Exhibition in Rome (1931), and later at the Biennial in Venice (2932), then leading to a great number of experimental works. The great earthenware sculptures section of the exhibition is dedicated to unique pieces which symbolize the peak and the essence of Martini’s art. Back in the 1950’s, this repertoire was acquired by the Museum of Antwerp; the exhibition heralds their return, for the first time, to the Italian public. Works include: La lupa (1932), Chiaro di luna (1931-32), Sport invernali (1931-32), Donna al sole (1930), beside Madre folle (1929), Le sorelle (Le stelle) (1932) Convalescente (1932), Ragazzo (1930), Venere dei porti (1932) and the masterpieces Aviatore (1931-32) and Attesa (La veglia) (1931-32). 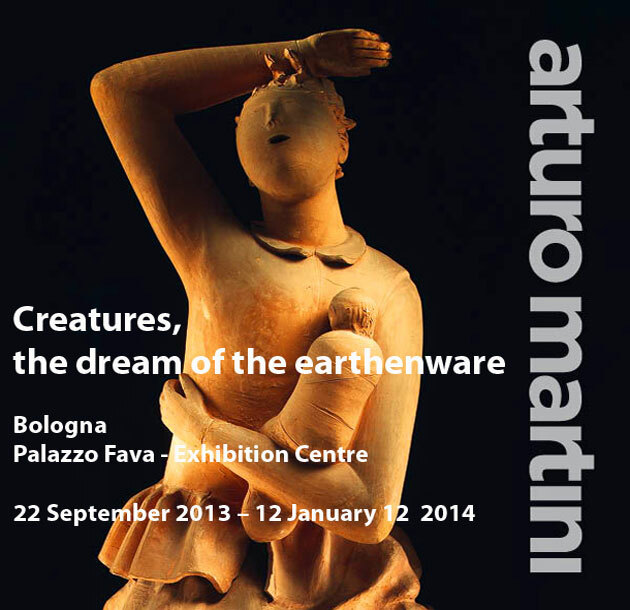 The Museo Internazionale delle Ceramiche in Faenza is the venue for a second exhibition: Arturo Martini. Harmonies. Figures between myth and reality, curated by Claudia Casali. About fifty works harmonically dialogue with the exhibition in Palazzo Fava and complete the artist’s creative career showing his different languages through the use of ceramics, bronze, wood, marble, stone and plaster. © 2019 Genus Bononiae blog - Museo della Città di Bologna S.r.l.